TOP 5 CONTRACT EMPLOYMENT MYTHS – DEBUNKED! Professional contracting can seem like a daunting and confusing way of working to some but traditional 9 to 5 work, is slowly becoming a thing of the past, with today’s workforce being made up, more and more of professional contractors. 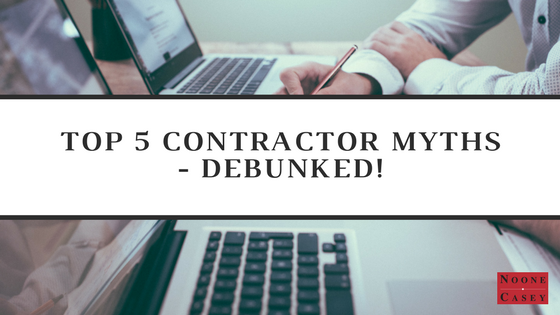 In this blog, we debunk 5 contract employment myths and demystify common misconceptions surrounding the world on professional contractors. Professional Contracting is project based, therefore it is quite the opposite. There may be some projects or work that you find boring, in which case, you don’t apply for that contract. Trialing several industry sectors and working with different teams and new people each time, results in exciting work, in an area you are passionate about. The professional contractor over the span of their career will work with many different teams, learning different approaches and new skills, making them more valuable in their career going forward. Working as a professional contractor does mean working independently, but this can mean different jobs for different types of people. Perhaps you like to work at home, in peace and quiet and your own pace, and therefore that is what attracts you to the employment. However, if you like to work with different teams and people, working on site is the perfect employment for you. The flexibility of the contracts means you can pick the projects that suit your work style and your situation at the time. There are also online groups you can join such as the Irish Contractors Group on LinkedIn and if you are a part of a network of contractors such as iFinance, you always have trusted business advisors to consult with. It is true that knowledge and experience can limit you in a job, however that is also true for permanent contracts. As professional contractors work on different projects with different teams across multiple sectors, they have increased knowledge and experience, learning from those around them. It is important for professional contractors to invest in their skills, as this investment pays off when applying for future contracts. From the beginning it is important to engage with a financial advisor. At Noone Casey we can make that headache go away. We use online accounting tools to ensure you have the most up to date financial information at all times. We advise you on your tax options, structure of company and ensure you are tax compliant. In turn we help you manage your money more efficiently. Making the most of each contract and ensuring you are always thinking ahead to the future. Employing a firm such as Noone Casey will provide you with a selection of ready-made and registered companies for you to choose from. All the running around is done for you which includes registering the company for tax purposes, assisting you in opening bank accounts and setting up payment plans for insurances and pensions. Working with multiple clients on different projects across numerous sectors, naturally starts to build a network. Once you work on a project, which results in a positive referral, you can continuously find roles that suit your skill set. If you treat networking as a necessary tool for professional contracting and continued growth, the bigger the network of possibilities.